Honey mustard and peach preserves add wonderful flavor. Prepare grill for medium-hot heat. In a small bowl, combine honey mustard, peach preserves and lemon juice. Place chops on grill rack. 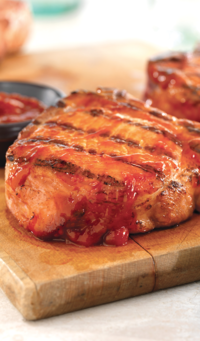 Grill and baste chops with honey-peach sauce, turning occasionally. Grill for 8 to 9 minutes, followed by a 3-minute rest time. Discard any remaining basting sauce.